No more than 20 hours per week in paid employment. If you work casual hours or on an ad-hoc basis through the year, average your working hours over a 12-month period to determine if you're eligible. Will the card be automatically sent to me? No. When you turn 60 and meet the other eligibility criteria, you can apply for a Seniors Card. Applications can be accepted by post up to one month before your birthday, as long as you meet the other eligibility criteria. Your application can be processed seven days before your birthday. Applications can be accepted online up to seven days before your birthday. Do I get a new card every year? No. Your Seniors Card doesn't expire so it doesn't need to be replaced. What do I do if my card is lost, stolen or broken? Contact the Seniors Card Unit (free call 1800 819 961) or email seniorscard@sa.gov.au and a replacement card will be ordered for you. There is no charge for a replacement card. When a new Seniors Card is produced, the old Seniors Card will be cancelled. Any balance on your card will be automatically transferred to the new card. your name so that we can send a new card with your new name. your address so we can update our records with your new details. Use this online form to advise us of your new address. Contact the Seniors Card Unit (free call 1800 819 961) or email seniorscard@sa.gov.au. How can I access Adelaide Metro public transport discounts? 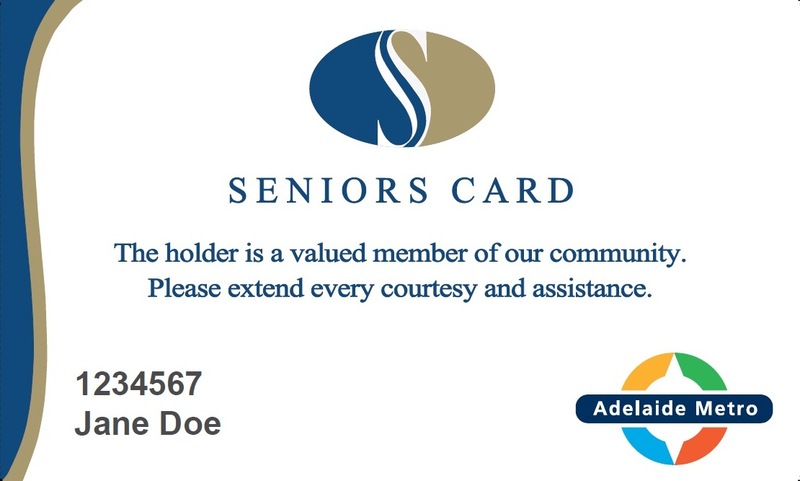 Your Seniors Card is also a metrocard for use on Adelaide Metro public transport. Your card is ready to use right away - you do not have to register the card before use. Can I use my Seniors Card interstate? Yes. Most business supporters of interstate Seniors Card programs will welcome your South Australian Seniors Card. You can also use your SA Seniors Card to access some concessional public transport fares in the state/territory you are visiting. Will an interstate Seniors Card be accepted in South Australia? Yes. Interstate card holders are welcomed by South Australian businesses and on Adelaide Metro public transport. Can I use my Seniors Card overseas? Yes. Thanks to a reciprocal agreement between the New Zealand Government and Australian state and territory Governments, holders of Australian Seniors Cards are able to access discounts from participating businesses in New Zealand. Additionally, holders of a SuperGold Card (New Zealand's equivalent) can access discounts from participating Seniors Card business partners when travelling to Australia. This arrangement does not include state or nationally funded initiatives such as free public transport. For details of participating New Zealand businesses, visit www.supergold.govt.nz or phone 0800 25 45 65 (when in NZ). Additionally, Seniors Cards are often accepted by businesses in other countries as a matter of goodwill. All you need to do is ask. Who can access the personal information I supply when I apply for a Seniors Card? The Seniors Card program collects and uses your personal information for the purpose of administering the program. This includes mailing your Seniors Card, providing you with free and discounted public transport services, government information and special offers and information from participating businesses. The program does not provide your personal information to participating businesses. We use a mail house contractor to administer our mail-outs. Emails are sent by the Seniors Card program. The Seniors Card program requires its contractors to treat your personal information confidentially and in accordance with the Information Privacy Principles (IPPS) Instruction. We may provide your information to other Government agencies that provide services to cardholders. We may also disclose personal information with your consent, or if required or authorised by law or our Code of Fair Information Practice. How do I suggest a business that I would like to see advertised in the Directory? Contact the Seniors Card Unit (free call 1800 819 961) email seniorscard@sa.gov.au. All suggestions will be followed up but we can't guarantee that a business will support the Seniors Card program. There are also some businesses who provide a discount to cardholders but choose not to advertise in the directory. Try to sort out the problem with the business first. If this isn't possible, contact the Seniors Card Unit (free call 1800 819 961) or email seniorscard@sa.gov.au. All complaints will be registered and followed up and we'll try to let you know the outcome where we can. Where can I find information about activities for seniors? Visit the section on staying active.